Some 88,300 unaccompanied minors sought asylum in the European Union in 2015, 13 percent of them children younger than 14, crossing continents without their parents to seek a place of safety, EU data has shown. More than a million people fleeing war and poverty in the Middle East and Africa reached Europe last year. While that was roughly double the 2014 figure, the number of unaccompanied minors quadrupled, statistics agency Eurostat said. 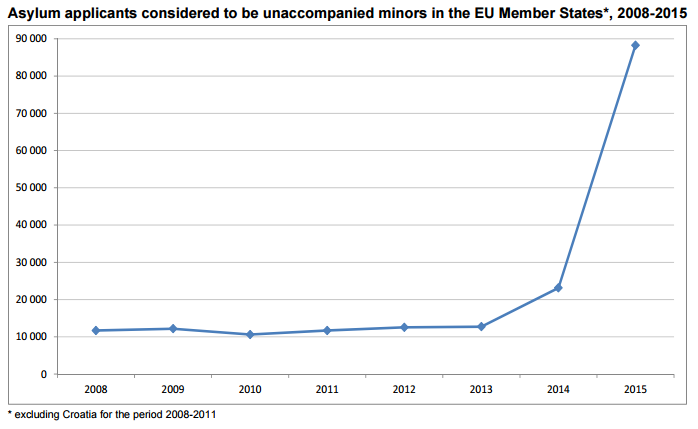 Minors made up about a third of the 1.26 million first-time asylum applications filed in the EU last year. European Union states disagree on how to handle Europe's worst migration crisis since World War Two and anti-immigrant sentiment has grown, even in countries that traditionally have a generous approach to helping people seeking refuge. Four in 10 unaccompanied minors applied for asylum in Sweden, where some have called for greater checks, suspicious that adults are passing themselves off as children in order to secure protection they might otherwise be denied. Eurostat's figures refer specifically to asylum applicants "considered to be unaccompanied minors", meaning EU states accepted the youngsters' declared age or established it themselves through age assessment procedures. More than 90 percent of the minors travelling without a parent or guardian were boys and more than half of them were between 16 and 17 years old. Half were Afghans and the second largest group were Syrians, at 16 percent of the total. After Sweden, Germany, Hungary and Austria followed as the main destinations for unaccompanied underage asylum seekers. Seeking to stem the influx of people, the EU has struck a deal with Turkey to stop people crossing from there into the bloc. Turkey hosts some 2.7 million refugees from the conflict in neighbouring Syria.